Jeffrey Thompson leans on a pillar on his front porch. He looks down his street — lined with blooming trees, green lawns and lush shrubbery — and tells me about his neighbors. Thompson is 57, and has known many of these neighbors for decades. He’s watched them move in, raise kids and grow old. And he likes his neighborhood. Thompson grew up a mile away in the Beecher Terrace housing projects, and since moving back to Louisville in 1997 after a stint in the Navy and some time living in California, he’s lived in this house on the 1700 block of Magazine Street. But when he came back to Louisville, Thompson found the Russell of the 1990s was different from the Russell of his youth. Businesses were shuttered, crime was growing and Russell had earned a bad reputation during his absence. For Thompson, seeing crime and poverty besiege his home hurts. Many people staying in Russell can’t move out — when factors like income, employment, education and health insurance are considered, the neighborhood has one of the highest rates of concentrated poverty in Louisville. Many don’t have the means to relocate. But others, like Thompson, a member of Russell’s Neighborhood Association, have chosen to stay. He’s among residents who, for different reasons, stay in Russell and other primarily low-income neighborhoods. When jobs were bountiful and Russell was dubbed “Louisville’s Harlem,” people followed opportunities to the West Louisville neighborhood. Haven Harrington, the former president of Russell’s neighborhood association, remembers those times. He said local employers like the Phillip Morris and Lorillard cigarette plants, as well as other Louisville manufacturers like Ford, General Electric and International Harvester offered well-paying blue-collar jobs, pensions and opportunities. When manufacturers closed and opportunities disappeared, people left. According to a U.S. Census Bureau Tract analysis, Russell’s population decreased by a third between 1970 and 2010. And a 2017 neighborhood profile by Metro United Way predicts the neighborhood will lose about another 10 percent of its population by 2040. To Harrington, those dwindling opportunities pushed residents away. Indeed, many Russell residents are in distress. Metro United Way’s neighborhood profile found 52 percent of Russell’s residents live below the federal poverty line. Forty-seven percent of neighborhood households don’t have access to a vehicle, and more than half the population who rent properties there spend 30 percent or more of their income just on housing costs. Though he can afford to leave, Harrington has stayed in Russell. He’s 44 now, and lives streets away from where his father and grandfather lived. Harrington likes the location, nearby recreational opportunities for his daughter and its urban setting. Russell has the potential and talent to improve, Harrington said, but it needs investments. It needs help. Though the Russell neighborhood has seen its population drop significantly since 1970, around 10,000 people still live there. Though some stay by choice, others are trapped by their economic situation — a situation which, Harrington said, can worsen if you’re black. 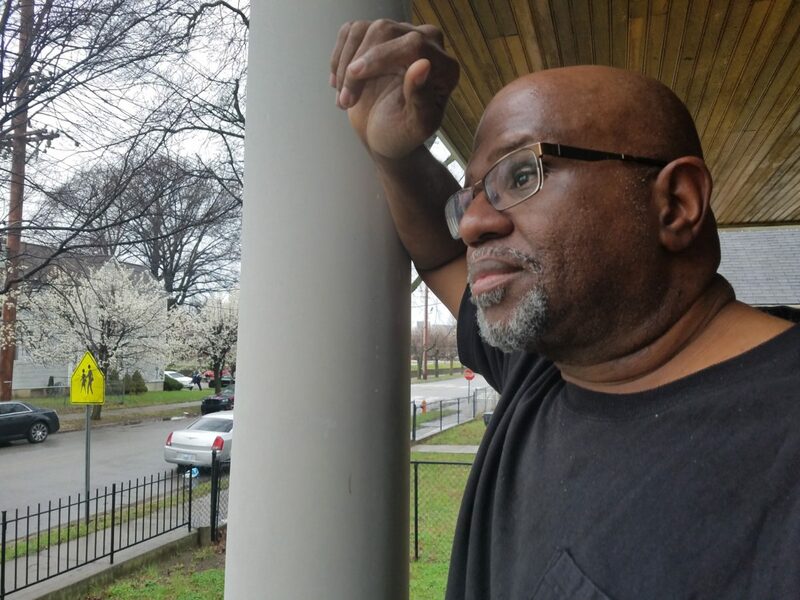 “Living in West Louisville a lot of times isn’t convenient because we have to pay what a lot of people used to call the ‘black tax,’” Harrington said, explaining that necessities like insurance are more expensive in traditional black neighborhoods. Eighty-nine percent of Russell residents are African-American. And the people living in the neighborhood have a disproportionately large exposure to violence. Between 2003 and 2017, 11 percent of Louisville’s murders happened in Russell. In 2016 and 2017, the city saw a drop in the overall number of homicides, but Russell’s count held steady: there were 10 homicides there in both 2016 and 2017. 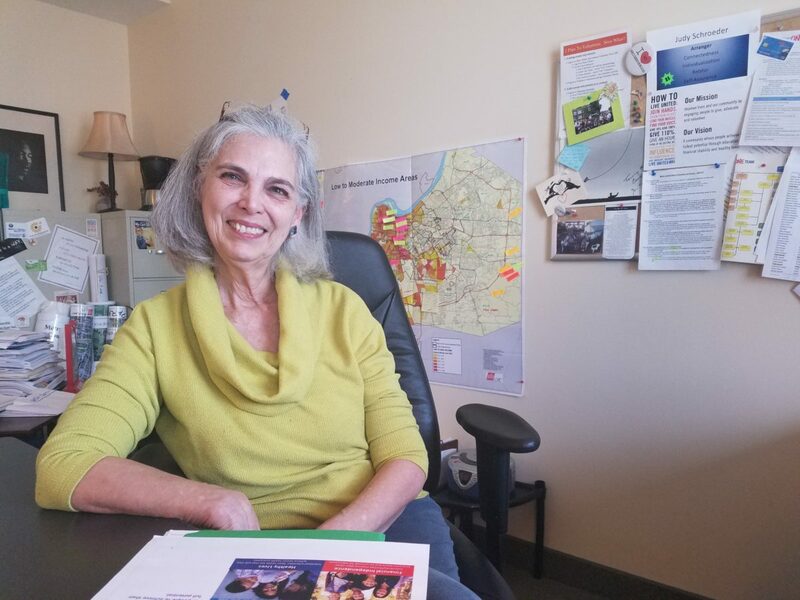 There can be legitimate security concerns for Russell residents, but Judy Schroeder, Metro United Way’s senior manager for neighborhood engagement, said many find safety and support within their neighborhoods. Schroeder’s work centers on early childhood education which, she said, plays a central role in why people stay in some neighborhoods. Schroeder said strong community networks often convince people to stay or move into neighborhoods like Russell and Portland. Schroeder knows that first-hand. She was born in St. Matthews, but chose to move to Portland where her mother and grandmother were raised. Schroeder said she feels more connected to the community in Portland, raising her kids within a network of extended family members. She stays in Portland where she raised her kids, and said residents often overlook a neighborhood’s negatives to be closer to people they’re connected to. Those connections offer safety and resources for residents to take care of their children, stay safe and find support. “It feels like home because of the extended family,” she said. When Jeffrey Thompson came back to Louisville from California to care for his mother, it was supposed to be temporary. But after being around his mother’s extended family and seeing her connections to the area, he realized moving her would displace her from her home, so he returned to the neighborhood where he was raised to live permanently. “The thing is — home is where the heart is,” Thompson said, seated at his kitchen table. He planned the home around his mother, ensuring it would make caring for her easier. She died a month before it was finished, but Thompson said this has become home for his kids who he raised here. Since then, his kids have grown, graduated college and left his house, but Thompson said they think of home fondly. They recall mornings when he played Luther Vandross, or times he would host family parties for the Kentucky Derby. Russell has the potential to improve, he said. But he cautioned that any development must involve residents to avoid gentrification. Thompson plans to be one of those fixers. For him, his kids, his neighbors and others, Russell is, and will continue to be, home.